OXFORD, Ohio – For the first 18 minutes, Miami played evenly against No. 5 Minnesota-Duluth and nearly matched the Bulldogs in shots. But a UMD goal late in the opening period and three more in an 89-span of the second spelled a 4-0 loss for the RedHawks at Cady Arena on Friday. 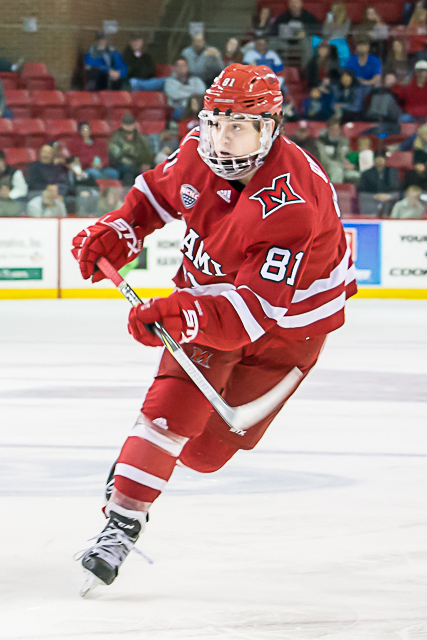 Hunter Shepard stopped all 23 Miami shots he faced for Minnesota-Duluth, which doubled up the RedHawks in that category the final 40 minutes. The loss extended Miami’s winless streak to nine games, its longest stretch since going 0-9-1 to close out 2016-17. RECAP: The RedHawks (9-10-4) appeared to win an offensive-zone faceoff on the power play, but the puck shot back to neutral ice, where Nick Swaney beat the defense to it, skated in, was partially tripped by Miami’s Derek Daschke and recovered to roof one glove side with 1:24 left in the opening stanza. The Bulldogs (13-6-2) made it 2-0 when Jackson Cates redirected a slap pass in from Dylan Samberg after the RedHawks’ Jonathan Gruden turned the puck over along the boards 3:45 in the middle frame. Noah Cates one-timed one past Miami goalie Ryan Larkin on the power play 55 seconds later off a feed from Scott Perunovich to make it 3-0, sneaking his slap shot from the top of the faceoff circle inside the far post. Just 34 seconds passed before UMD’s final goal, which was scored after Larkin lost his stick while being bumped out of position, and Parker Mackay deposited a behind-the-net pass from Justin Richards into the vacated net. That ended Larkin’s night, as he was relieved by Jordan Uhelski. The game got chippy late, as RedHawks captain Grant Hutton was later given a major and game misconduct for checking from behind and MU’s Karch Bachman and UMD’s Riley Tufte were assessed roughing penalties after their lines paired off following an interference call against the Bulldogs. STATS: Coming off the bench, Uhelski stopped all 15 shots he faced. — Miami was 20-40 (.333) in the faceoff circle. 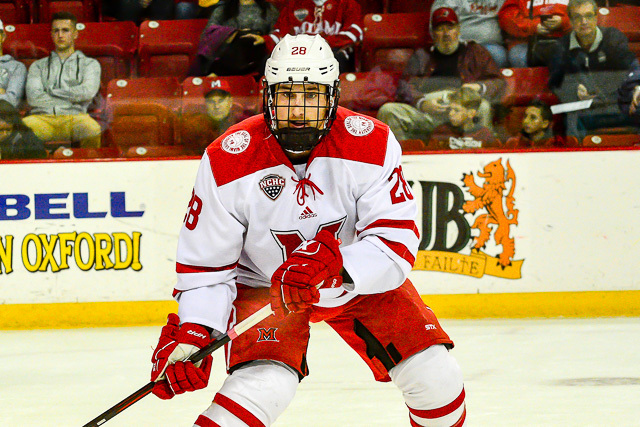 — The RedHawks shut out Minnesota-Duluth in the third period, snapping a string of 15 straight frames allowing a goal. 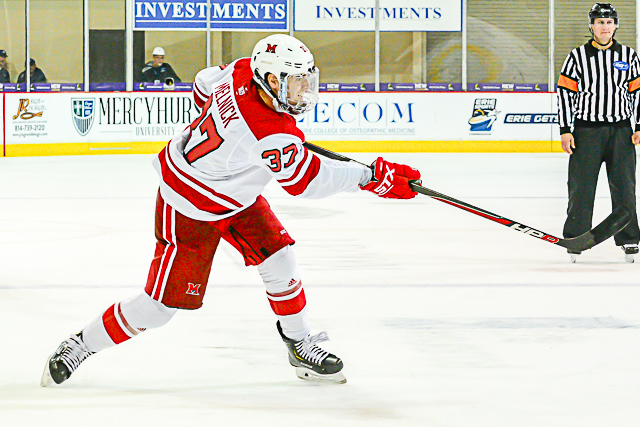 — Eleven of Miami’s 23 shots came on its five power plays, as the RedHawks spent 8:06 on the man-advantage. — This was the third time this season MU has been blanked. THOUGHTS: It’s become a recent MO for Miami: The RedHawks came out strong again but were once again deflated when allowing that first goal. With 90 seconds left in the first period, Miami went on the power play so it appeared the worst-case scenario would be a 0-0 score heading into the second with a brief 5-on-4 to start the next frame. Instead, Swaney’s shorthanded goal in the final minute-plus gave UMD a huge momentum boost heading into intermission. Arena staff made its best effort to fire up fans by cranking ABBA, but three Bulldogs goals early in the second frame later essentially sealed the game. That makes eight middle-stanza goals against in five games for the RedHawks. To be fair, once again MU battled hard in the third period but the outcome had been decided by that point. Duluth was the better team in practically every aspect: The Bulldogs scored twice at even strength, once on the power play, once on a Miami power play, they dominated on faceoffs, seizing loose pucks, were way better passing, miles better defensively and got better goaltending. — The major on Hutton was the right call. He had multiple seconds to decide if he was going to bury Cole Koepke, who had his back to the play along the boards, and the ultra-strong Hutton followed through and hammered him face-first into the glass. Especially as a captain, Hutton can’t make that play. — Uhelski prevented this game from being 7-0 or 8-0, stopping a breakaway and a 3-on-1. Following the latter, a Miami fan yelled “where’s the rest of your team?” There was no answer. — Miami had taken a major step forward on draws this season, especially with the addition of Monte Graham, but the team has been miserable in the circle recently. The RedHawks are 40.9 percent on faceoffs their last six games and have won a third or fewer draws in three of those contests. — Miami’s leading scorer, Josh Melnick, was scratched for the third straight game with a lower body injury. He is considered week-to-week. His absence is huge because in addition to his 19 points, he is solid on draws and one of the team’s best defensive forwards in addition to being a team captain. FORWARDS: F. Thirteen forwards scored zero goals and generated 14 shots, many of which were of the low-percentage variety. Despite the decent shot total on the power play, there was no flow on the man-advantage from this corps. Gruden had an easy clear opportunity on the second UMD goal but overskated it. He was also the forward at the point when Swaney blew past all five Miami skaters to score on his breakaway. This Melnick-less group’s passing wasn’t particularly impressive either. Scott Corbett dished out a couple of good hits, but that was one of very few forward highlights. DEFENSEMEN: D+. Friday’s game footage will not be used by Hutton for his personal highlight reel. He was late reacting when Jackson Cates scored that second goal and as mentioned above, he deserved his major. Daschke was a little flat-footed on that shorthanded breakaway. 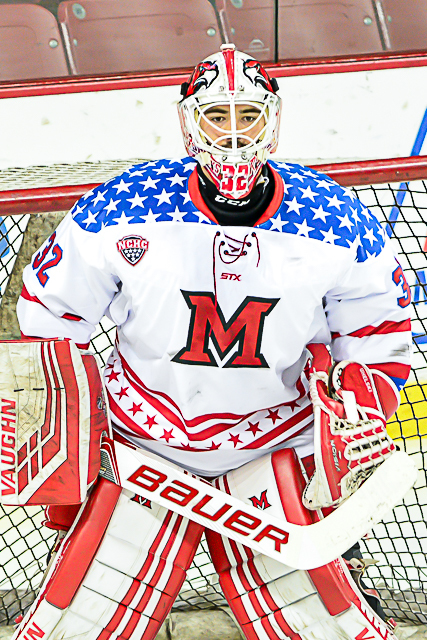 UMD managed 37 shots, equaling the fourth-highest total allowed by Miami this season. River Rymsha was first star out of this group. GOALTENDING: B-. The first goal was on a breakaway, the second Larkin had no chance on, the third he should’ve stopped and the fourth he lost his stick and positioning when he was bumped at the side of the crease. Larkin wasn’t that bad but he wasn’t great either. Uhelski was great and had to be or this one would’ve gotten out of hand. Individually Larkin was a C-, Uhelski an A.
Miami’s Zach LaValle (photo by Cathy Lachmann/BoB). LINEUP CHANGES: Melnick missing his third straight game was the biggest news in terms of the lineup. It was hoped he would return for this series but he will shoot for Colorado College next weekend. Defenseman Andrew Sinard sat after playing six straight games, as the RedHawks elected to use 13 forwards. Zach LaValle dressed in that extra spot after being scratched for the last six. Uhelski was the starter last Saturday and ended up logged 35 relief minutes in this one. FINAL THOUGHTS: It was the first regular season home game for Miami in seven weeks and proved quite anticlimactic. It feels like the game could’ve been completely different had Swaney not scored late in the first period but that seemed to shift the Bulldogs’ play to a higher gear and Miami could not match UMD in any facet for the balance of the game. Minnesota-Duluth looks like a team poised to repeat as national champions, and in this game, the RedHawks were nowhere near that level. Posted on January 19, 2019, in 2018-19 and tagged 2018-19 miami redhawks, jordan uhelski, josh melnick, Minnesota-Duluth Bulldogs, river rymsha, scott corbett. Bookmark the permalink. Leave a comment.